Recently I sat among thousands of on-lookers, sweating under a blistering Texas sun watching high school graduates thankfully receive their diplomas. I will tell you more about it in another post soon. However, my son was among the sea of pointy, tasseled hats, and I, of course, beamed with pride. He’s done good work- flipping through pages of textbooks, sitting for difficult exams, and prioritizing his academics- and he deserved to enjoy that moment. I know I certainly felt a visceral happiness when I walked across the stage, toting my hard-earned diploma, soaking in all the praise and recognition that came with that piece of paper. Around campuses everywhere every spring, people are obtaining diplomas and degrees, mapping out professional lives, starting jobs, and entering the supposed real world. Enamored with inspirational language and both intrinsic and external pressures, most of these individuals have their eyes on achieving impressive professional endeavors, and many of them will likely work very hard to reach those goals. These individuals deserve our recognition. Their persistence and grit is admirable and ambitious. However, they are not the only ones who deserve praise, recognition, and attention. In this, I advocate for the individuals who may not be walking across their university stages, who may not be climbing the proverbial corporate ladders, who may not aspire to be the manager, leader, or boss of their workplaces. I advocate for the good people who often fall in the cracks- for the people who want to do “good enough” and exert their mental energy on other hobbies, relationships, or caveats. I advocate for the people who may not have the luxury, privilege, or capacity to pursue certain achievements- but who are worthy and amazing people nonetheless. I advocate for this demographic of people, because I am this demographic of people. I advocate for the person who needs someone to tell them you don’t have to want to be the best, and that doesn’t mean there is anything wrong with you. It’s the scariest thing to openly admit to your boss that your job is not your #1 priority, for fear of being overlooked for growth or opportunities. I know, because I’ve done this. But what kind of person would I be if my family didn’t trump all else in my life?! I’ve personally chosen to diversify my success and achievements in all the important areas of my life. At best, this is ignorant thinking, and at worst, it represents a black-and-white expectation of perfectionism and the vicious race towards achieving it. Some people enjoy that kind of race, that kind of challenge. Others prefer a different pace- a different challenge. But friend, listen up, we have room for all of the above, and we have room to acknowledge and even celebrate everyone’s individual paths towards well-being. Rather than focusing on external value- through the job titles and resumes and annual salaries- I advocate celebrating different kinds of successes. The father or mother who chooses to stay at home to raise a child. The full-time employee who feels content with where he or she is, even if (gasp), it means they aren’t necessarily striving towards a leadership or management role. The non-committal individual who works at a job simply to make a paycheck and a living. It’s okay to have big dreams, and it’s okay to have small dreams, and it’s okay to have changing dreams. You aren’t any less important if you don’t feel the burning need to have a flashy, demanding career or mouthwatering paycheck. Climb ladders if you want to- don’t climb them if you don’t want to. Simple as that. You aren’t less intelligent, less ambitious, or even less attractive. Your priorities are just different, and THAT IS OKAY. 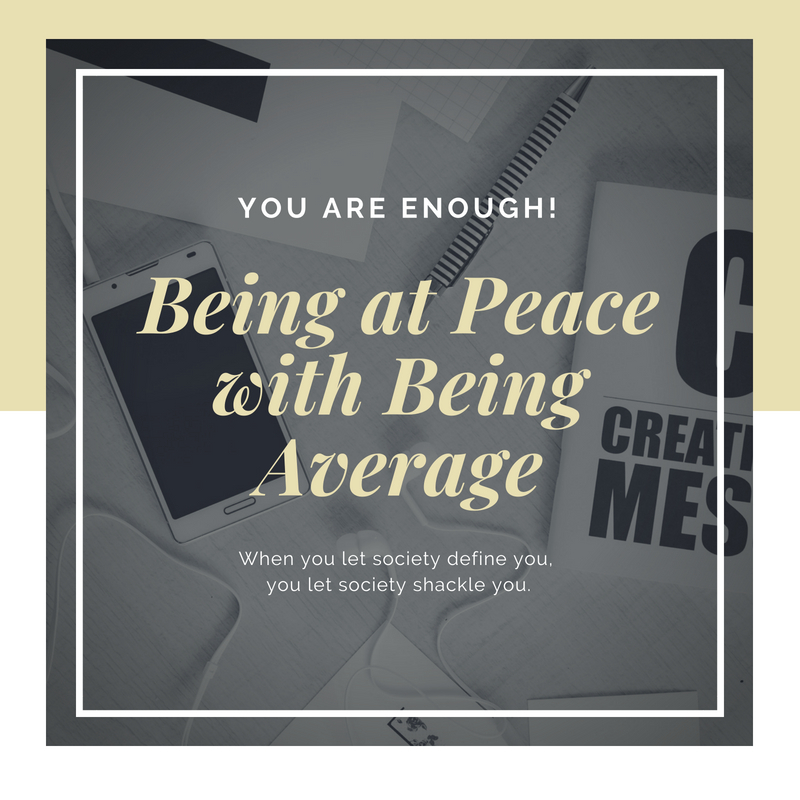 It is okay to just want to do “good enough.” It is okay to even feel at peace with being average or right-in-the-middle. It is okay if your dreams don’t revolve around work, school, or external success. Give your dreams some credit! They don’t have to fit any cookie-cutter mold. They don’t have to conform to anybody else’s expectations! And like I tell my kids, you are only a failure if you decide you are a failure. When you let society define you, you let society shackle you. Success feels great-I think we can all agree on that-but YOU decide what that success feels like. And it’s okay if not everyone agrees with that definition.